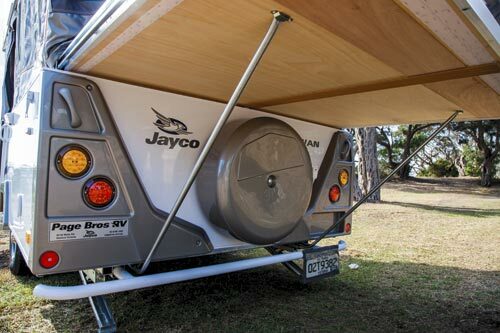 The Jayco name has been synonymous with memorable family camping holidays since 1975, when the company first began building camper trailers. 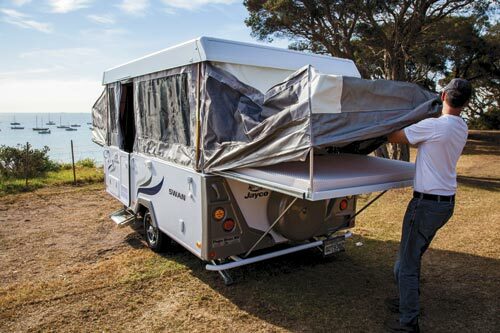 With the Jayco brand now claiming 46 per cent of the camper market, I had high expectations when I picked up our Swan test trailer — and I wasn’t disappointed! 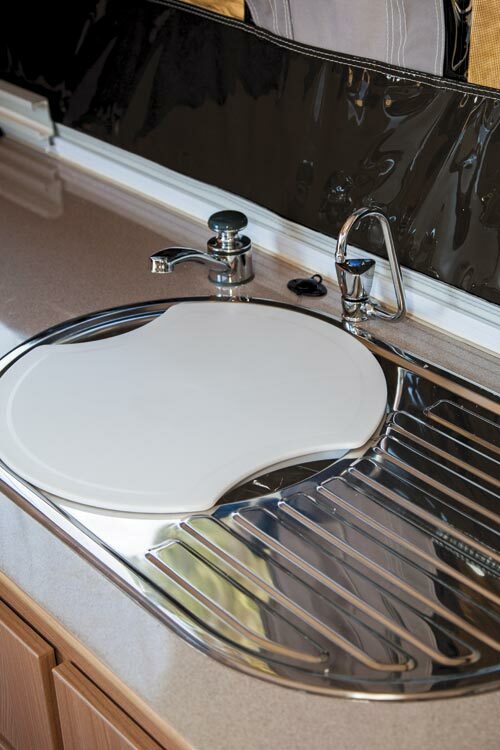 The boys and girls at Jayco have done their homework to deliver a visually striking package both inside and out. The body is finished in a high-gloss gel-coat complemented by contrasting coloured trims, decals and attractive alloy wheels. The canvas is colour matched, constructed from quality Australian-made Bradmill canvas and double stitched for durability. The foundations for the trailer are a hot-dipped galvanised chassis and a drawbar of 100x50x3mm — fitting for a camper of this design. 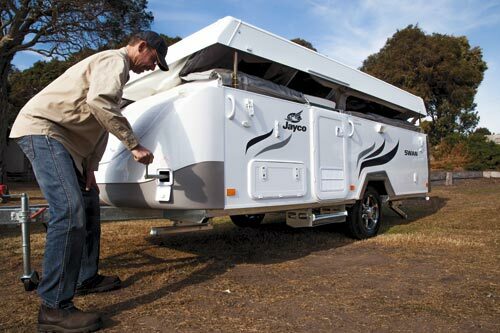 Jayco refers to it as its Endurance chassis, with cut-outs in the chassis members supporting the floor designed to offer superior strength for less weight compared to a box-section chassis. 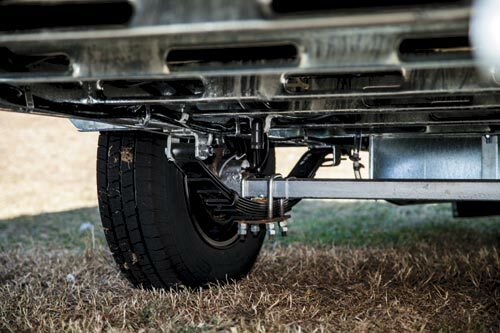 Suspension is courtesy of a simple Al-Ko six-leaf spring pack complemented by 10in brakes. An 82L poly water tank sits behind the rear axle shrouded by light-duty shielding to the front and base only. On the drawbar you’ll find a standard ball coupling, handbrake and a removable jockey wheel. 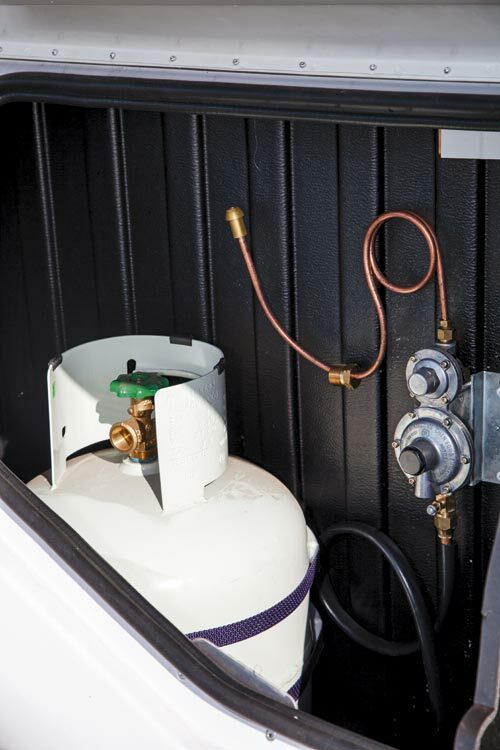 The latter is stowed in the large lockable front boot when on the move, adjacent to the 9kg gas bottle in its own compartment. 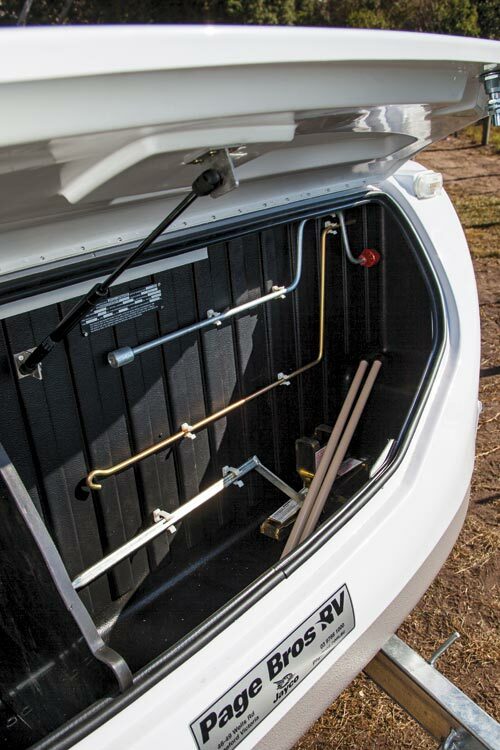 A wind-up jack for tyre repairs is also supplied and there’s a winch handle for the roof, the latter neatly stowed on clips on the wall for easy access. 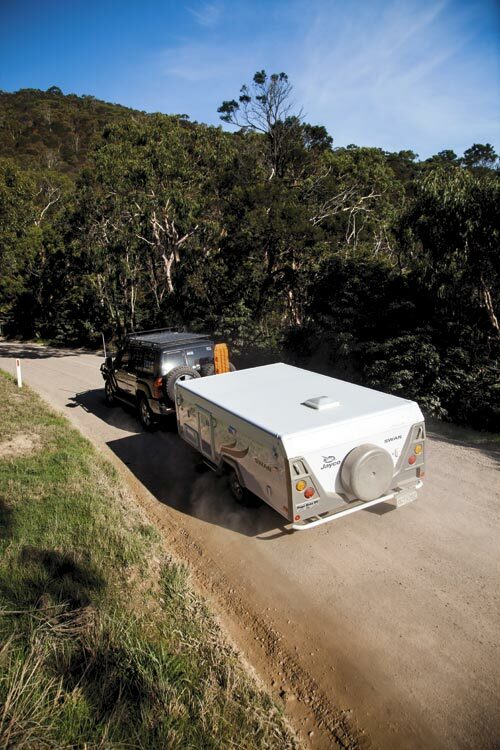 The Swan is one of the larger camper trailers in the Jayco range, measuring 5365mm end to end and 2240mm across its girth. 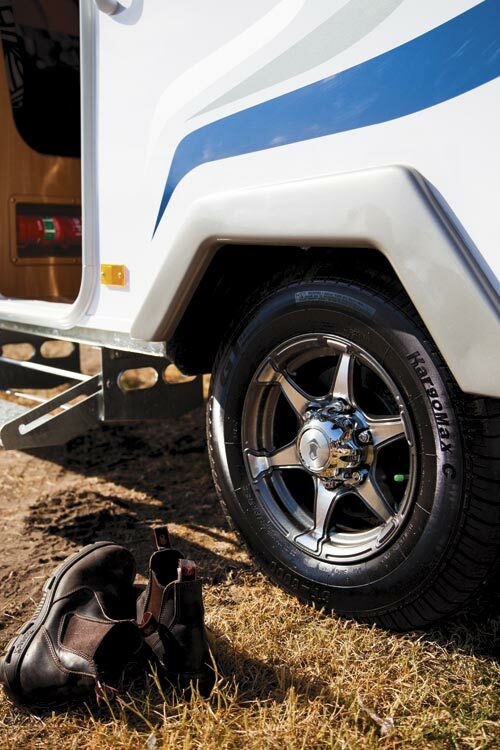 Travelling height is 1660mm, keeping a relatively low profile and minimising wind drag, and with a tare weight of 1055kg it will be suitable for a range of family-friendly runabouts. The body uses the latest hail- and dent-resistant fibreglass skin on composite walls constructed from an interlocking aluminium frame, plywood and the interior panel. On the driver side there’s a secured water inlet, vents for the fridge and a TV aerial. 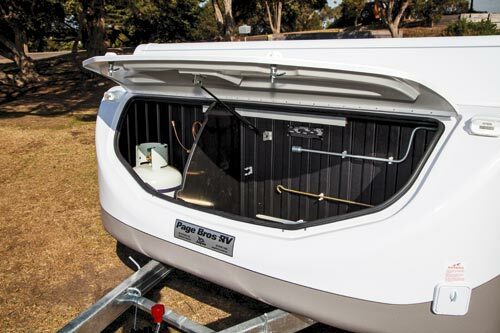 The passenger side has a full-height two-piece insulated door (new for 2013), 240V outlet, a storage compartment (also accessible from under the lounge) and an awning light mounted to the body at chest height. Arguably, you might get a better spread of light if it was mounted to the roof, although light output might also be a factor. At the rear is a powder-coat bumper bar with the spare mounted to the body. The latter is dressed in an ABS gloss cover matching the trim, adding further visual appeal. The one-piece fibreglass roof provides additional strength. The tent is a one-piece design manufactured in-house using computerised cutting processes for accuracy and quality. 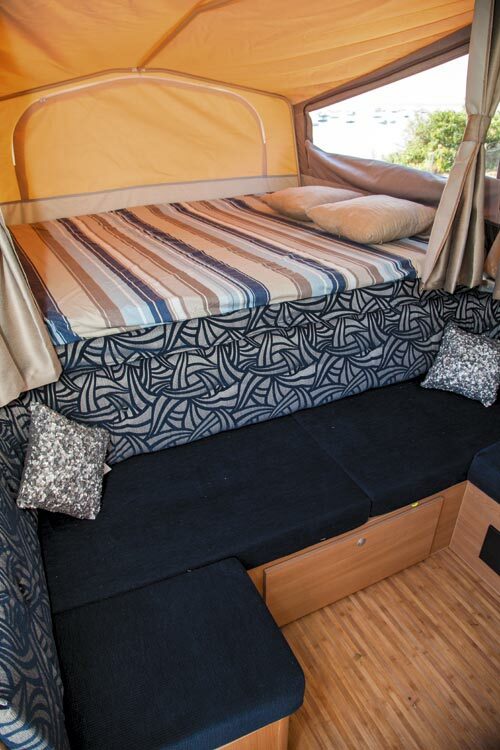 It employs large windows that bring the outside in, standard flywire and smoked clears that can be zipped down to allow maximum ventilation. The top half of the door is mounted to the roof in transit and swings down to join the lower section. Setting up is a simple and quick process. Unclip the four catches and wind up the roof, which features an automatic brake to resist slipping backwards as it rises. 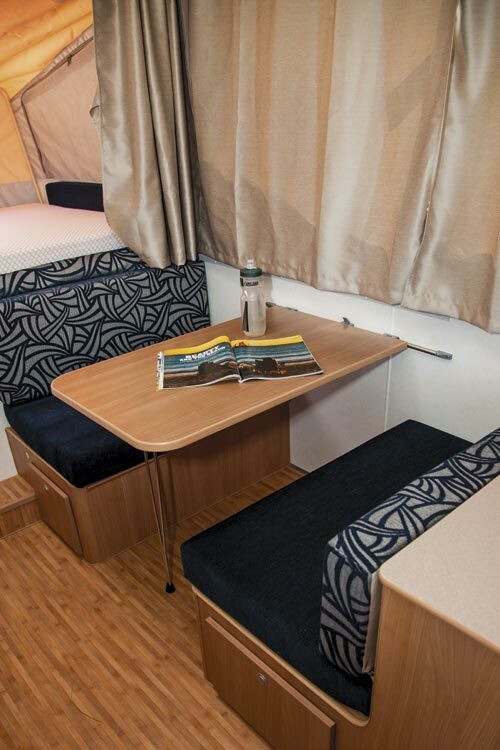 Pull the bed ends out with the assistance of the built-in rollers and add the bed support poles. Inside, the bed-end canvas is supported by a bed bow that pivots up from the mattress adjoining a hockey stick that runs to a centre clip. As a first-time user on a brand new van, I found the canvas a little tight, even with my back on the bed and bracing the bed bow with my feet. With the door lowered from the roof and joined to the lower section, the set-up is complete. Like the exterior, the interior is warm and inviting with quality and attractive furnishings not unlike a well-appointed executive apartment. 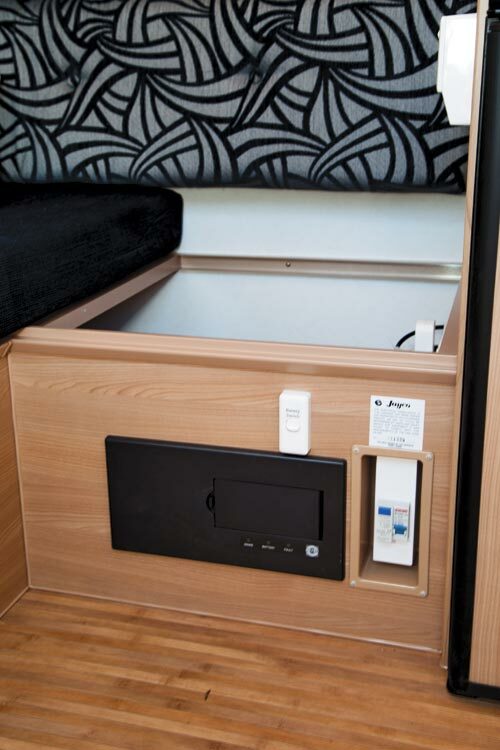 The outward bed ends allow for an impressive 6505mm internal measurement with plenty of room to move and the layout makes the best use of the available space. 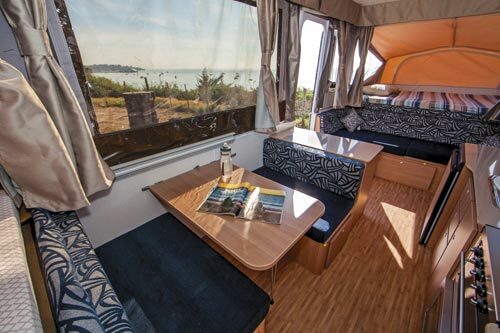 The Swan can sleep up to seven with a front queen bed, rear double, dinette drop-down table/bed and use of the front lounge with an optional bed converter. Arguably though, it’s best suited to four or five — at least if you want to coexist happily. Attractive window curtains keep out the light and cold. The upholstery offers antimicrobial protection to keep mildew at bay and has also been given an anti-allergy treatment. There’s a buffet on the right-hand side as you enter with four drawers and a cupboard with dual doors. Adjoining on the passenger side is the dinette, which seats four people in comfort. Over to the driver’s side, a full-size robe that folds down in transit provides hanging space for coats and clothes. 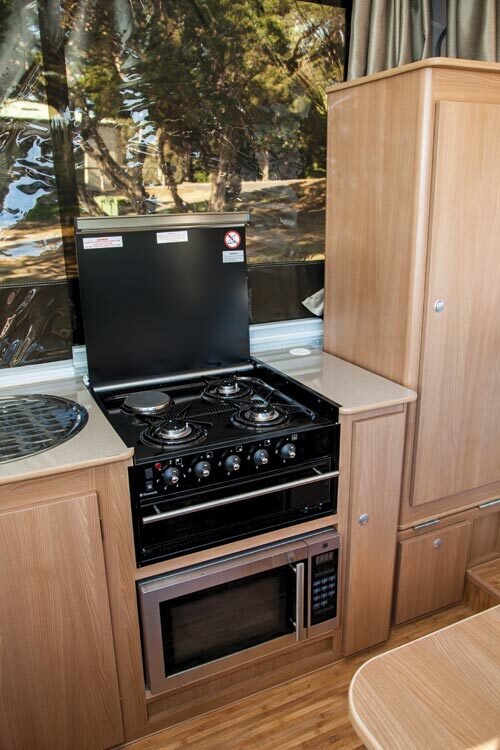 A Smev four-burner stove/grill with glass splashback has three gas burners and one 240V one. It sits above a microwave, which rests at floor height. This is perhaps the only flaw in the layout. Ideally, it could be positioned just below bench height. Otherwise there is a large sink and draining board that provides some additional bench space when the sink is not in use and plenty of cupboards and drawers, the latter with catches. There’s a double power point near the three-way fridge and a second below bench height near the stove. Electrics are limited to a safety switch, 12V lighting, fuse panel and a Setec power converter managing incoming 240V current. The converter has LEDs indicating whether you’re under 240V or 12V power and basic fault detection. The unit also provides a trickle charge to the optional 100A battery when connected to 240V. Three interior lights are fitted, each individually switched allowing you to save power if needed. 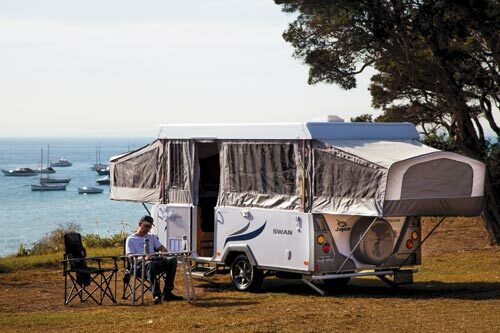 If optioned with a battery, this set-up is suitable for short-term free camping interspersed with longer caravan park stays. On the road the Swan was barely noticeable behind our Nissan Patrol during the test loop, slipping through the air with ease and hauling up as required when on the anchors. Although not promoted as an offroad trailer, it tracked well along our dirt road leg, unphased by the low-level corrugations and dust. If you have a curiosity to explore offroad, the optional Outback pack is a clear winner, offering improved ground clearance, shock absorbers, outback-rated springs, strengthened chassis and drawbar, offroad electric brake magnets and a bunch of other worthy additions. 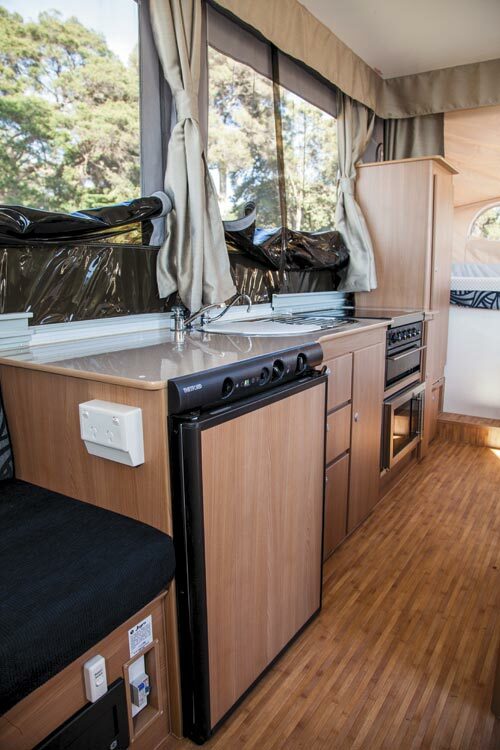 Other options include an auxiliary battery, roof racks, oven, external barbecue, awning, bed-end flys, hot water, external shower, electronic stability control and an electric winch for set-up. 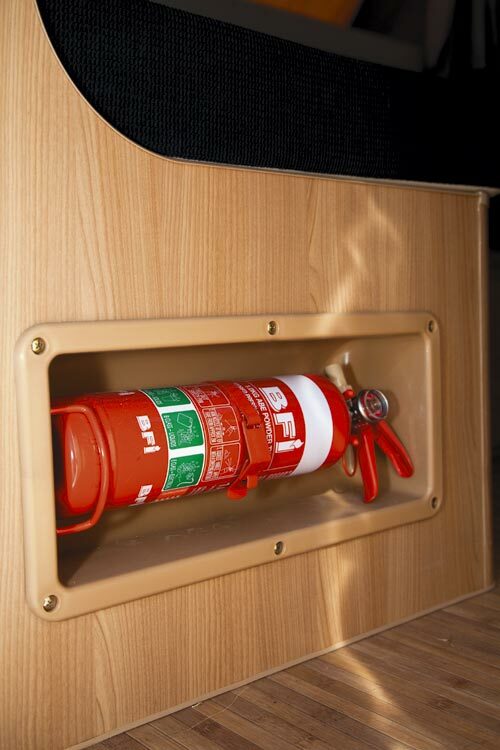 Fit, finish and build quality was generally of a high standard, with only a few blemishes. The application of filler around the skylight wasn’t particularly attractive. Similarly, underneath the chassis there were a few screw ends poking through the floor by an inch or more, looking a little unfinished. These are small gripes in the scope of things and did not detract from the overall craftsmanship at eye level. 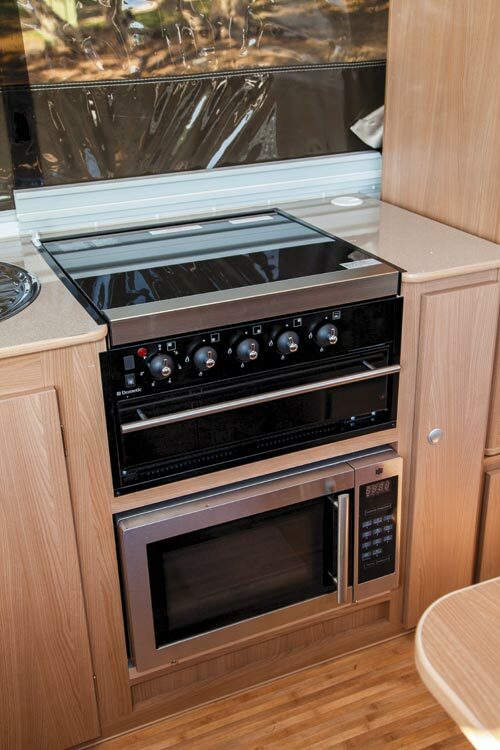 It is not hard to see why Jayco is an industry leader. 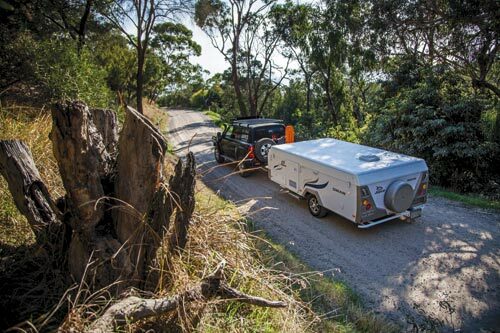 Its trailers are bang on target for the family market with comforts, features and attractive styling, all at a sharp price point — $24,331 as tested, including on-roads. Beyond the sharp pricing, the value-add is the three-year roadside assistance package and service agents all over Australia. At least if things should go awry, parts availability and help are close at hand. Few family campers offer so much for so little.